Today, on the third day of Heritage, the students and adults embarked on a resounding journey that tested and informed their values of identity, legacy and community/family responsibility. 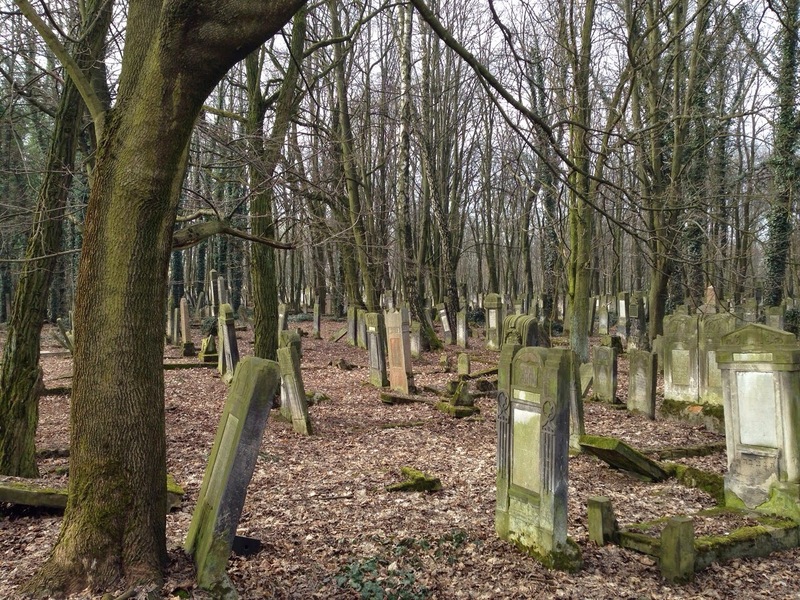 Our first destination was the Lodz cemetery located in Lodz, the second biggest city in Poland. We were told that before the war there were about 230,000 Jews living in Lodz, a third of the city's population. When we arrived at the cemetery we learned that this cemetery was the largest in all of Europe and held the graves and mausoleums of Jews before, during and after the war. This meant that at this one stop we would get to see Jewish life and morality over vast periods of joy and devastation. What we found was fascinating and laid out a template of thematic ideas for the rest of our day. 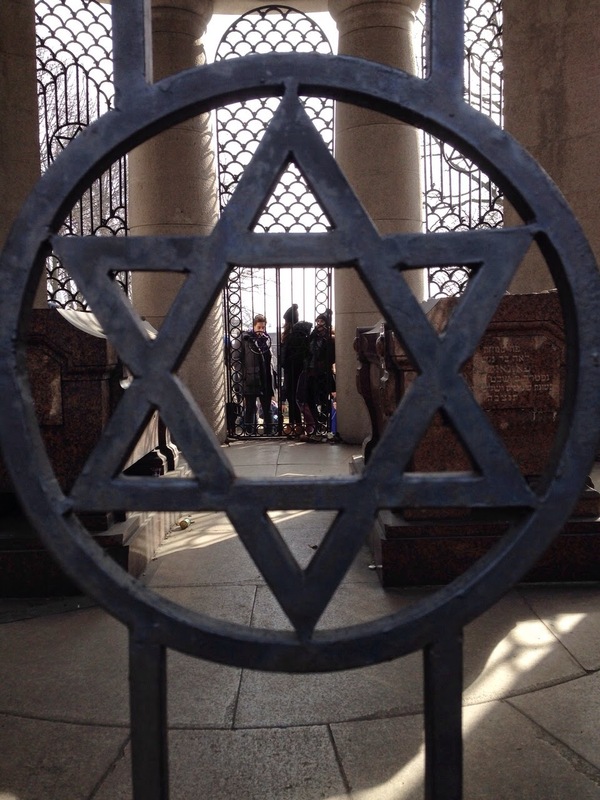 As we stood by the grave of Lodz's only rabbi, Rabbi Eliyahu Chaim Meisel, we were exposed to a character with supreme philanthropic values and a binding sense of community responsibility. We were told a story of when someone had asked Rabbi Meisel why he had never written a book. Rabbi Meisel then reached into his pocket and took out promissory notes with which he borrowed funds to provide for the needy. The notes which comprised "his book" were far more expository than anything he could have written on his own. We then continued to the incredible mausoleum of the Pozanski family, that used their own benevolence to provide for the community's needs. As we continued through the cemetery we came across a new theme, that of respect and defense for Jewish identity and legacy. We learned about the significance of putting a stone on a grave as Rabbi Prag explained the Hebrew acronymic definition of the word "stone" and it's allusion to Jewish legacy. Our next point at the cemetery was more eerie. We had arrived at the location of graves constructed for people deceased during the wartime period. We arrived to a seemingly endless lawn filled with small signs. We were told that the Israeli Defense Forces had returned some 10 years ago from Israel to construct graves for thousands buried during the war. We then discussed the idea of respecting Jewish identity, inasmuch as everyone shall receive a proper individual burial and subsequently a provisional grave marker by the IDF. To find that Jewish identity, the very reason why the Jews had been faced with such devastation, still remained essential during the war was astounding. But even more astounding was the idea of Jewish identity after the war which we found at our next point in the cemetery. We arrived at the edges of 6 deep pits in the grass along the edge of the cemetery. We were told that these were graves that Jews working in the nearby Lodz Ghetto had dug for themselves after the liquidation of the ghetto. Miraculously, the evening before these graves were supposed to be put into use, the Russians came and rescued the Jewish workers. Our tour guide, Rabbi Shiloni, had told us a story of a group he had lead 2 years ago to the same site. At this site a non-religious young lady found that one of the workers was her grandfather. Along the edge of this pit the young lady uttered two word which she had never uttered before "I'm Jewish." This refreshed sense of Jewish identity and acknowledgement of our legacy and family responsibility was one we carried for the rest of our day. Our next destination was a quick look at the Lodz Ghetto area where we considered the disparity that the Jewish value of family responsibility faced during the war. We stood along the fence of the ghetto and were handed photos taken by Mendel Grossman that were taken in the very place we were standing. We learned about the history of the ghetto and its unsettling statistics. We were told of the organization of the Ghetto and it's director, Chaim Ruchovsky. We considered ways in which Jews were able to resist the harsh treatment and stringent organization of the ghettos. We looked in our own hands, that were holding the somber images of misplaced families and children along the ghetto fence to find that we were holding the strongest force of resistance. Mendel Grossman, commissioned to photograph the glory of the ghetto, instead used his camera as his artillery to attack the conditions which contested the Jewish people's heritage and values. Next stop was Radegast Station, right along the Lodz ghetto. There we entered the station which served as offices for arrivals and departures of the ghetto. We found infinite names listed on pages and pages of records. We then walked to the platform and into a cattle car. Attempting to place ourselves in the same horrific conditions that our ancestors faced, ran a chill down each of our spines. We stood packed like sardines, but within this aggregation we found a unifying bond, a connection to our legacy and to one another. We sang a resounding rendition of "Ani Maamin" and were then told the story of a man who witnessed the death of his father in one of these carts. He had begged the other men in the cart to help him in the reciting of Kaddish, and they did so out of dedication to the notion of community responsibility. Then Margie Bijou, mother of Isaac, read the story of a young lady who was separated from her mother. Her mother had told her to remember two words "t'harat ha'mishapcha", maintaining the sanctity of family identity. We saw again our 3 integral themes in the small confines of the cattle cart. The next destination were the two extermination camps that comprised Chelmno. The earliest and most primitive form of a death camp that was created and in use even before Operation Reinhard. At the Schlosslager, or "Palace Camp" we had arrived at the ruins of a castle that served as the grounds for which Jews from the Lodz Ghetto and neighboring villages were rounded up and forced into cargo trucks that doubled as gas chambers. We entered a museum alongside the ruins and saw what the Jews had brought along with them upon entering the death camp. Everyday object such as keys, toothbrushes and dentures proved that these people had not anticipated their deaths. We then reached the second part of Chelmno, the Waldlager, or "Tree Camp," a burial site nestled into the forest a few minutes away from the other site. Here each one of us sat along the edge of the unfathomably large pits to read and reflect upon the atrocities the Jews faced in this camp. We then arrived at 3 small pits outside the entrance of the burial site. These 3 pits served as the burial site for bodies that were found under the ground. Our tour guide had found small bone fragments within the site and collected them. At these 3 pits we proceeded with a moving burial service for the bones we found and discussed once again the value of preserving Jewish identity and upholding our legacy. Sol Horovitz then recited Kaddish at this site where it was most likely that 15 of his unknown relatives were buried. Our next stop was an impressive one as well. We arrived at an attic in an apartment building in the town of Donbia where we found the remnants of what was once a shul. Boys prayed mincha facing what was left of the Aaron Ha'Kodesh. To end our poignant day we entered a Bunker in Czestochowa. The experience was extremely frightening as we recreated a story of a family of Jews who hid out in a locked cellar for 12 days packed tightly in absolute darkness. Feeling the heat, darkness and lack of air consume our minds only gave us a taste of the peril the family must have faced during the war.